Today’s Q&A Monday features an interesting question about muscle atrophy in the hand and what to do when Western medicine doesn’t have a solution. Learn how to promote the flow of energy and increase blood circulation to the hands and arms to benefit muscle atrophy, repetitive strain injury, carpal tunnel or any condition where there is weakness, tingling, numbness and/or pain in the hands and arms. Q: I have muscle atrophy in my left hand. My thumb muscle has already started to waste away and the strength of my left hand has become weaker. I’ve been to hand specialists and they were not able to find the root cause although one UCSF physician believes pinched nerves in my spine as a possible cause. I would like to learn of pressure points I can massage to stimulate blood circulation and to clear energy blocks to my left arm and hand. Shift your thoughts to ones that support healing. The first step is to release any attachment to the condition. It took time for the atrophy to develop and it’s very understandable that this condition concerns you greatly. However, over time, as you live with this condition, little by little you begin to focus more and more attention to it. It starts out very subtly until you don’t even realize that you are always checking to see how weak your hand is, comparing what your left hand can or can’t do relative to the right or comparing it to how strong it used to be. 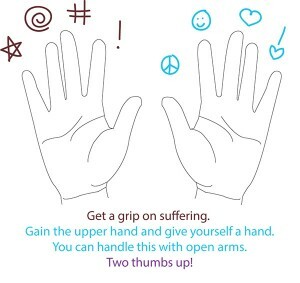 By doing this, over time, you are reinforcing your thoughts to see your hand as weak. For readers suffering from pain, numbness or tingling, it’s hard not to notice because you’re always feeling this constant reminder. As a result, you begin to accept the condition as the norm because you expect it to be there. That’s when it becomes a part of who you are. It’s time to break this train of thought because it doesn’t support your healing. Right now, the most important thing is to embrace that you WILL UNEQUIVOCALLY RECOVER 100%. If your body can maintain a strong and healthy right hand, it can also restore a strong and healthy left hand. Here’s an exercise to help you move into this belief because I know it can be tricky to go from observing the atrophy every day to suddenly believing you will be whole again. Please start this right now. It’s simple, easy and sublimely subtle too. Might as well take advantage of the power of your subconscious and conscious mind! Make a list of every possible way to get there. The purpose of the list is not to find the solution now. The purpose is to open up your thinking to possibilities and more ideas. So, whenever you catch yourself noticing the atrophy in your hand, pull out your list and brainstorm ways that your hand can be healthy and strong again. Feel free to come up with the most fantastical list of possibilities. The more outrageous the better. There’s a hand specialist out there who knows how to fix this. Someone tells me about a new surgery that shows great promise for my condition. I find out my diet is missing a nutrient and once I start eating it, I feel so much better. I become an expert in making hand shadows and get invited to join a children’s entertainment troupe and the movement of my hands to create joy for kids magically heals me. I practice Chinese Reflexology and my body returns to balance and heals itself. Remember that the purpose of this list is NOT to come up with a logical and feasible solution. The purpose is to open your mind to healing. Over time, you’ll find your thinking softening to believe you can heal and as this happens, the ways to be strong and healthy again will emerge and become clear to you. You’ll write something on your list, or you’ll review your list and suddenly one thing will call out to you and you’ll KNOW with every cell in your body that this is what your body is seeking. You can’t shortcut this process. It takes time to shift. Allow it and give it time to develop. When you know without question, without debate, that’s when you’ve found your answer. Build your Qi (energy) and send it flowing powerfully through your hands, wrists and arms. In the early 2000’s, I was working a very stressful job that made me quite grumpy and stressed out, which by the way, is a severe understatement. I had always been very fluid for most of my adult life, yet bit by bit, the strain and irritation of my career wore down on my body. Over time, this tension wore down the sinews and tendons in my body until I had reached the point where my wrists were so weak that I couldn’t turn a doorknob without experiencing pain. My naturopath told me that the cartilage in my wrists was wasting away. Because I hated my job, I felt angry and resentful at the demands made on me (e.g., being expected to work until 3am, but being told I wasn’t a team player because I took an hour off between 9am and 3am to eat dinner). This anger disrupted the flow of energy in my Liver channel. Since the Liver governs the sinews/tendons, this imbalance eventually resulted in stiffness and tightness in my body. At the same time I was angry, I was also overthinking and worrying way too much. This depleted the flow of Qi in my Spleen meridian. The Spleen is said to control the muscles and the Four Limbs. When Spleen Qi is weak, the muscles and limbs don’t receive adequate nourishment. For me, that manifested as the wasting away of cartilage. Massaging the Chinese Reflexology points for the liver and the spleen would be very beneficial to help increase Qi in the Spleen meridian and also to smooth the flow of Qi throughout the body. However, what would be even more beneficial is to get to the root of what is really disrupting the flow of Qi. For me, it was the anger I felt and the massive amounts of data I had to process to do my job. All this stess and over-thinking disrupted and depleted the Qi in my body. For muscle atrophy, the Spleen meridian plays a more important role. For pain, the Liver channel is the star. If you are very analytical, set high standards for yourself, and have been through a period of high stress (or prolonged chronic stress), then you’re a textbook case for Qi disharmony. I have a great Qi Gong exercise that powerfully sends energy flowing through your hands and also calms the mind and clears away negative thoughts and emotions. I’ll be sharing this in my next article on, The Nature of Qi. Watch for it in a couple of weeks. The Western approach is to focus on your hand (or wrists, or arms, or wherever the symptoms are most visible). I would recommend taking a more holistic approach to healing. Look at your whole body to heal. The atrophy in your hand is a condition that took time to develop. A normal, healthy and balanced body simply does not start wasting away. Similarly, if you are experiencing pain such as RSI or carpal tunnel syndrome, these are manifestations of an overall imbalance in your body and your life. Rather than look only at where the problem is most visible, recognize that it is a whole body imbalance that has created the conditions for weakness to manifest. When you take this view, you empower yourself because then you know that anything you do to strengthen and balance your body as a whole, will help to improve your overall health. A healthier and stronger body is then more capable of healing itself. Of course, I have a bias to using Chinese Reflexology to strengthen and balance the body. It’s powerful because there’s no diagnosis or analysis needed. Your feet are your body’s way of telling you exactly where energy imbalances are and where support is most needed. Chinese Reflexology sessions are very beneficial to balance your body as a whole, but what’s more important is that YOU believe this. If you’re reading this article and decide to try the “thought shifting” exercise, check in with yourself in a couple of weeks. If you experience that sense of knowing that I mentioned in this article and feel that Chinese Reflexology can help you, I invite you to book a Chinese Reflexology session with me in San Jose, CA. As well, please keep your eyes open for the Qi Gong exercise in the next article to be published a couple of weeks. And, one more thing…check your free Chinese Reflexology foot chart to see where the Liver and Spleen points are located and test them for sensitivity as directed in the free online lessons which you’ll get when you sign up for the reflexology charts. Simply fill out the form below to get your Chinese Reflexology charts and online lessons. You’ll also receive my newsletter, Amazing Feet. It’s a fun way to learn self-healing tools and techniques for the body, mind and spirit. Because of the volume of emails I receive and because I’m a full-time mom, I unfortunately can’t answer everyone’s questions personally. That’s why I created Q&A Mondays. You can submit your question on the Got a Question page.